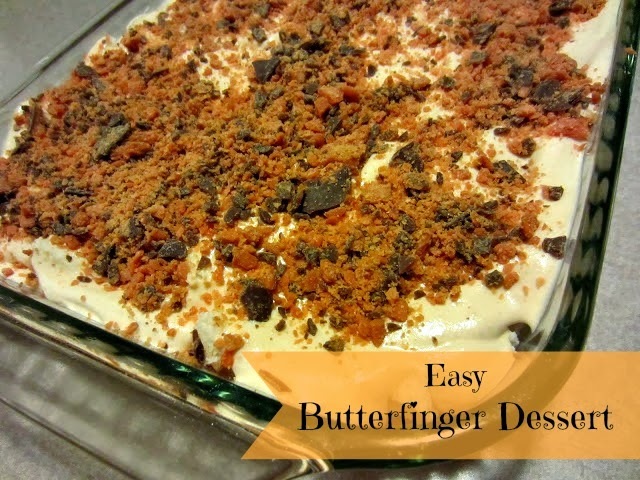 Easy Butterfinger Dessert is Weight Watcher approved and absolutely delicious! It's also got a super easy preparation that you will love! Sugar free pudding is spread onto store bought angel food cake and layered with crushed Butterfinger candies for an easy no bake dessert everyone loves! This Butterfinger Dessert is cubed, store bought angel food cake, layered with a sugar free pudding fluff and crushed butterfinger candy bars! Everyone gobbles this dessert up...even if you aren't following the Weight Watchers program!! This Weight Watchers dessert would make a wonderful dish to take to a potluck or a dinner with friends. I found my inspiration on Pinterest. I did make a few changes that I think make my version the best one out there! The original recipe used vanilla fat free, sugar free pudding mix..but I subbed butterscotch flavor...and I don't think I would make it any other way. The butterscotch and the butterfinger flavors were great together, and since you dilute the pudding with quite a bit of cool whip free, it is becomes a very subtle flavor in the "fluff" part of the dessert. 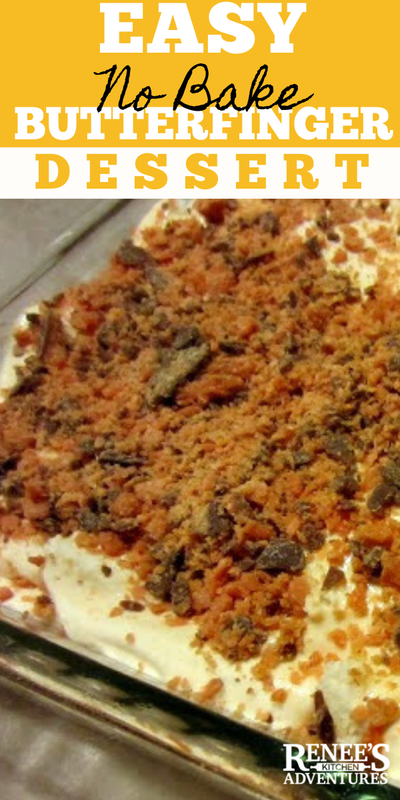 How do you make Butterfinger Dessert? The super simple, no bake, preparation involves cutting up a premade, store bought angel food cake into cubes. ( I purchased a cake from my grocer's bakery department) Then, you mix the pudding mix with skim milk and the Cool Whip Free to make a fluff. After that's done, you just layer the ingredients into a 13 x 9 inch pan. My mini food processor made an easy job of chopping up the fun sized butterfinger bars for the butterfinger part of the no bake dessert. The whole thing came together in minutes. *Note: This is an older recipe on this blog and it's gone through points, points plus, and now smart points with the Weight Watchers program. I'm not providing points, but rather, nutrition info, so you can calculate the points accordingly. In large bowl, combine the pudding mix with skim milk. Whisk until starting to thicken. Fold in both containers of Cool Whip Free*. Pour half the "fluff" mixture over the cubed angel food cake in pan. Top with half the crushed butterfinger candies. Repeat with rest of cake, fluff and candy. Cover and refrigerate for at least an hour before serving, or overnight. Enjoy! *If you can't find Cool Whip Free, you can use SF Cool Whip instead, but the nutrition information may be different. We are having such spectacular winter weather here in NE Ohio this year! I got out to clean the outside of my windows today....FEBRUARY 6th! Unbelievable! I usually dread the month of February every year..but with such great weather and so much sunshine...it hasn't been too hard of a pill to swallow this year. How about you? What month of the year is your least favorite? More NO BAKE dessert recipes you'll love! Another recipe keeper from Renee!!! It's super sunny here in Vancouver too. We have high hopes it'll last at least a few days longer. Have a great week. This looks great what size are those bars not sure what fun size is. Maybe they have a weight to the bar. Thanks so much I want to try this. This sounds so good! But I think I'll make it with the regular pudding and cool whip because all the extra chemicals added to the sugar free and fat free kinds totally freak me out. I'm sure it will be wonderful with the full fat and regular pudding...just remember with those changes, the nutritional info above will not be accurate. Enjoy! Just made this. I am diabetic so have to be VERY strict with my sugar and carbs. I ground up unsalted peanuts, sugar free chocolate pieces, and walnuts in a little food processor, and used a sugar free angel food cake. Maybe not Butterfingers, but close. Still has some carbs, but at least brought it down some more. Thanks for the recipe. Delicious! I think I'll add a layer of chocolate fluff in mine as well. I've been doing WW for almost a year with little success because of my wicked sweet tooth. This sounds fantastic. Just what I needed. I also live in Ohio and hate Jan and Feb.
What site do you use to get nutritional stats? The one I have been using doesn't figure fiber. I currently use Sparkrecipes to calculate the information. It allows me to input my specific ingredients. I love this. I have made it using Heath bars (you can also use Skor bars. It take 3 full sized. I have also left off the candy and used crushed pineapple that I poured over the cake before putting the pudding on. Did you drain the pineapple before pouring it over the cake? You'll have to come back and let me know. I have never seen SF angel food cake! What a nice thing to find! I'm trying this tomorrow night for company. I'm also substituting Heath Bar for Butterfinger ...I'll let you know how it is! I made this using sugar free angel food cake and Heath Bars. It was wonderful! 1/12 of the recipe (a nice big piece) came out to 3 WW PointsPlus. I ran it through the WW recipe builder. I'm making another one tonight as soon as the Cool Whip defrosts! YUM. Sounds wonderful! I love this recipe because you can get so creative with the flavors and add ins! Hi Lorrie! No, it's not a mistake. The sugar free pudding mix box weight is 1 oz. This is the weight of the dry pudding mix. I hope you give it a try! can we stop making desserts and calling them "not bad" Five points is almost a quarter of your points for a day when you've hit maintenance. Also please stop telling people it's low in sugar (I'm seeing that circulate on Pinterest, which is how I found the site). This recipe has 80g of sugar per serving. Even if you took out the angel food cake (which obviously you shouldn't) there would be 18g of sugar per serving. It looks delicious, but we have to stop kidding ourselves that these sorts of desserts are "good." They are an indulgence and that's okay, but we should stop deluding ourselves about what's "good" and sabotaging our own health. If you read the text that goes with this post, I never referred to this dessert as healthy, low sugar, or "not bad". I agree, any dessert is an indulgence. If you follow the WW points plus program (not the old WW momentum program) you will know that you are given 40 points+ to use during the week on things like dessert. This dessert is simply an option to other choices which may have a higher point+ value. Thanks for posting this recipe -- it looks delicious and I'll be making it tonight! Sorry for the comment above; we're all intelligent enough to make our own decisions about what we choose to make and aren't easily fooled by claims of "healthy". Those of us on WW (and other plans to improve our health) need to find some options to replace all the junk we used to eat. This one looks great! Keep 'em coming! I love this dessert & have been making it for over 10 yrs. I have used vanilla, lemon, & white chocolate pudding which turns out amazing. My new favorite is using chocolate angel food cake with chocolate pudding & the new chocolate cool whip frosting. Heavenly!!! this looks FABULOUS and I will be trying... but, I just have one question. Why is it necessary to spray the pan with cooking spray? You could probably omit this step. I do it just to make sure if leftovers start to dry out, washing the dish isn't an issue. But to be honest,it rarely lasts that long. Makes sense...thank you!!!! :) I can't wait to try. Brownie Points for being WW friendly! It's so helpful to someone like me! I plan to make this over the weekend and I didn't purchase the sugar free pudding, I just got the regular instant butterscotch pudding. Is one box going to be too much? I think the weight is 3.4 oz. One box of regular instant pudding is fine. It weighs more than the sf box because sugar weighs more than sugar substitute. Hope you enjoy it! Can I use instant pudding? And what size Box do you use,? Hello! Yes, you use instant pudding mix. I think the size is still 1 oz. sugar free. Hope this helps!